← Swine Flu Cruise Ship Refused By Grenada – Heading For Barbados… Now What? This won’t go over too well anywhere. Last Friday night the Bahamas Women’s National Volleyball team were playing at Garfield Sobers and were ordered by Barbados officials to move all their bags to a locked room for security. After the game they returned to find everything – and we mean everything – stolen. Clothes, passports, wallets, jewellery, cameras, ipods, laptop computers, credit cards, watches… you name it. 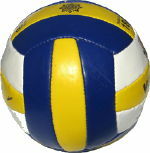 One would think that as a courtesy to visiting teams, the Barbados Volleyball Association might have provided someone to keep an eye on players’ possessions – you know, so we wouldn’t have foreign news media reporting a mass theft against our guests and our country’s “lukewarm”, disinterested response. So what does the Bahamian team really think of the response from the Barbados Police, the Barbados Volleyball Association and others to their plight? The “officials” who insisted that the bags and possessions be moved to the locker room should also have ensured that the room was secure but I’ll bet dollars to donuts that no one will take responsibility for it. I’ll also bet that it wasn’t the first time items were stolen from a locker room at the Gymnasium, watch other come forward and confirm that there were other thefts. Again watch for the reaction of the same “authorities” now that this story is front page news in The Bahamas, they’ll fall over everyone to try to make things right but the damage has been done. What a wonderful memory for these girls from the Bahamas! I am sure they and all their friends and family will want to return soon. It sounds like a setup to me by the person who asked for the articles to be moved and not those from the Barbadian team? The reaction of the RBPF instills such confidence and concern that one might conclude that they really don’t give a s–t. All of these personal belongings that were stolen will start showing up and lead the police to who stole the loot but don’t hold your breath as this would involve a little police work. A friend of mine waited all day yesterday for Forensics to come to a crime scene, he couldn’t get any information from phoning, except ‘someone’ would be there, well ‘someone’ never turned up & he had to secure the premises before night,(this crime was committed over the w/e) so waste of everyone’s time, except the criminal of course, who will get away again, thanks to the RBPF. Seems to me someone got to get shoot before anyone is vaguely interested………. Sundowner, you didn’t miss much. After a robbery at one of our commercial premises, I showed the “CSI” man a full set of fingerprints on the top of a cupboard that the thief had used to haul himself up to the hole in the ceiling by which he had entered. “I can’t get a print from that surface.” is all he said before leaving never to return. I thought that modern methods allow them to find prints on almost any surface, but not in Barbados, apparently. Is this really true? Seems hard to swallow and who is responsible for this sorry state of affairs ? Guess not us. Are we still pushing Sports Tourism? If we are, we have just pushed it over the cliff. Yes it was Ian, but the story didn’t mention that the Bahamian team had to wait so long for police or that people are lukewarm to helping them. News Update: Police are questioning a Christ Church man in relation to the theft at the gymnasium. Too bad this incident happened. The headlines mention “robbed” but it appears more of a theft. Robbery is used when there is violence or the threat of violence. From the coverage it does not seem that the victims were present when the crime was perpetrated. Had this been a robbery, it would have been an even more serious crime. Why are we so quick to comdemn Barbados. This whole story in the Bahamian newpaper sounds slanted, accusing bajans of stealing. Barbados is not Utopia and whether or not a bajan did it, the point is, it was done in Barbados and we must be held responsible. However, the police have their method of investigating a crime and just taking statements is not the main thing. Immediately after the incedent, a squad was assigned to the case, that is why they were able to crack the matter so quickly. Next, you might asked about other cases that take much longer. The answer is simply, the lack of personnell. Our Police Force is seriously unmanned, to the point where certain officers don’t see home for almost a week and in some instances, don’t get sleep for over 24 hrs. Instead of criticising the fellows, give them a few kudos for keepng Barbados fairly safe as compared to other countries in the Caribbean. Check the murder/crime rate in Jamaica and Trinidad; only this week St.Lucia’s police commissioner has been pleading for assitance in curbing the increase in crime in that country. Barbados has the widest diversity of foreigners/migrants in the whole region, yet our police force have been able, with limited resources to keep crime down to a controllable level. This didn’t happen accidentally, it is because of the hard dedicated work of the Barbados Police Force. dese fellas duh charge is bajans? wuh I neva hear bout nuhbody in Babadus wid dah name? Anyhow uh glad de Bahamians getting back duh tings. Yesterday, Jemel Martin Polin, 20, a labourer, of Bartletts Tenantry Road, Sargeants Village, St Michael, appeared in the District “A” Magistrates’. Meanwhile, Jamar Emmanuel Polin, also of Bartletts Tenantry, Sargeants Village, Christ Church, is expected to appear in court today charged with theft of the gear. If you read the artical, it stated that the door was FORCED open, maybe by a crowbar. The police force would have been damned if they do and damned if they don’t. This same Bahamian team is reported to say that the police was doing nothing. i would advise you to leave policing to policemen. In Barbados, policing is already left entirely to the police. There is no civilian oversight and only rarely does the coroner become involved with deaths in police custody or deaths caused by police. Even then, the coroner only works with the evidence collected by police as, unlike other professional police organisations, the RBPF is allowed to investigate itself without any independent oversight during the investigations. I just happened upon this article – I was actually googling another robbery. I was one of the players who got robbed. To be honest I am still upset, every time I think about it – I get mad all over again. I was also one of the players who was unimpressed with the police’s response initially (by the end they warmed me over a little). Probably if my I-phone was returned or my diamond ring that my mom gave me for christmas was found – my experience would have been better. With that said I realize what the officers were working against and I understand that in every country there are people who seek to commit crimes. We were promised compensation but never got it, which made matters a little worse. Would I come back? Maybe in a couple years but I would be more careful. Would I recommend Barbados to friends? Possibly, I still think its a nice country. What do I think about the police? They do what they can with the resources that they have, but Can still do a much better job. For instance, the police took our statements and because they were all so similar, copied and pasted the statement of one and applied it to all – which I’m still stunned about. It may have worked if she had bothered to change up the names and stolen items of each player. What I appreciated most were the words of encouragement from strangers who had heard about our plight. One lady brought Food from the chicken place (I can’t remember the name) for my entire team. Another woman in the airport was so concerned she wanted to give us money. Little gestures, such as those I mentioned above made an unbearable situation less heartbreaking. So, to those people I say thank you! To the officers that really tried to get our things back, thank you! I hope I didn’t offend anyone!